Ben McConnell and Jackie Huba are stalwarts of the highly popular Church of the Customer blog and founders of Ant’s Eye View. 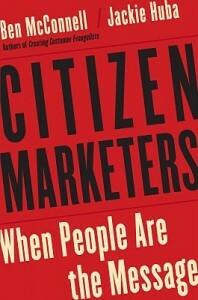 Proponents of customer evangelism, community marketing and good old Word-Of-Mouth (WOM), McConnell and Huba’s book Citizen Marketers: When People Are the Message reads alot like their blog, using numerous examples and stories to drive home the point. Firecrackers are like the one-hit wonders of the online world, and they generate trending topics that grow very quickly but can also die down as fast. An example is the recent Old Spice Man Youtube videos, as well as Vincent Ferrari’s notorious AOL Cancellation Video. Citizen Marketers highlights the now familiar One Percent Rule, which cites that a tiny proportion of users generating content on social networks (Wikipedia, YouTube, Flickr, MySpace, Digg, etc) can exert a disproportionate influence throughout the network. Through the advent of Web 2.0 technologies, the playing field is leveled as everybody has a fighting chance to make an impact through their own digital content, networks and influence. Peppered with numerous case studies, the book paints a rosy picture of how citizen content creators are democratizing media akin to how Johann Gutenberg’s invention of the printing press democratized literacy. Hobbyists and volunteers like Eric Karkovack who started Save Surge (and later Vault Kicks) to petition the Coca-Cola Company to resurrect a dead soda are lauded as the altruistic brand activists of the 21st century. On the same token, fans may not let any company off lightly if deceit is discovered. High profile examples include Working Families for Walmart, Lonelygirl15, and the failure of Whole Foods CEO from disclosing his involvement in anonymous Yahoo! postings. Community – To succeed in creating an enduring online community, it is suggested that one’s consciousness of kind (eg. being a New Yorker), adoption of shared rituals and traditions, and sense of moral responsibility to the community is key. To those new to the world of social media marketing, Citizen Marketers provides a good starting point to understanding how influence spreads. However, it provides more of a tour of what’s happening in this space rather than practical and tangible strategies. What’s more, most of the case studies cited appear to be those of already established companies with well-known brands. Unless you have an extremely innovative or remarkable product or service in the first instance, it would be a mammoth task trying to form fan clubs of engaged citizen marketers to support your cause. Admittedly, the social media universe have changed since the book was published in 2007 and online community engagement is now more challenging than ever (Facebook and Twitter weren’t in the reckoning then). However, some of its principles are still enduring, like the fact that companies should let others do the talking for them without overt interference. Overall, I’d recommend this book as a good way to understand how one can better engage one’s online stakeholders and to better manage the process of community marketing and engagement.